Interested in bulk orders or corporate gift giving? Please call us at 214-484-2797 for ordering. Please allow 2-3 business days for standard delivery, or indicate the date in the future that you would like your order to be delivered by. We will schedule delivery to arrive as close as possible to your requested date. Should you need to guarantee delivery before 2-3 business days, or on a particular date, please indicate this in the special comment section of the order form or call us toll free at 214-484-2797(M-S 10:00 am to 6:00 pm CST) for priority shipping options and pricing. If you have any questions about placing an order or pricing, please call 214-484-2797. While we will make every attempt to adhere to the below tables as much as possible, holidays and unforeseen circumstances can force exceptions to the shipping and delivery schedule. For orders shipped during holiday season, please see the Holiday Ordering Information below. If you are shipping to an area "INSIDE" the Hot Pink area or the Turquoise area you are eligible to use our ground service. If you are shipping to an area outside these two color coded areas it is NOT safe or recommended to ship by ground service. Outside the Pink and Turquoise area requires 3 or 4 days to ship to these locations and by then your package will not be safe to consume. If you are shipping to an area "INSIDE" the Orange area or the Bright Green area you will need to select either 2-Day Air or Standard Over-Night. Again, for the safety of your package we can only accept this mode of transportation to these areas. Shipments to Alaska and Hawaii must go Priority Overnight. Sorry, we cannot ship outside of the United States, due to customs regulations. Important: All shipments require a street address (sorry, no PO Boxes, APO or FPO addresses.) Damage due to incorrect or incomplete shipping addresses voids our guarantee. We do not ship to Canada or over-seas. Hawaii and Alaska require an additional shipping fee of $15.00. All changes affecting your order must be received at least 7 days before your requested ship date. If you require one of our products shipped Priority Overnight, please call 214-484-2797 for pricing and to place your order. Typically, The Cajun Turkey Company will ship your order using either UPS Ground, 3 Day Select®, 2nd Day Air®, and Next Day Air® due to the perishable nature of our products. If for any reason the FFA grounds all UPS planes due to bad weather and we miss your scheduled delivery, under no circumstances will The Cajun Turkey Company be held responsible for the delay in the delivery of your package. 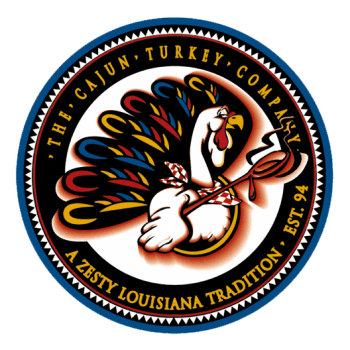 In addition, if the package spoils due to the lateness of the delivery, The Cajun Turkey Company will not be responsible.